It is recommended that labels be stored in their original packaging or boxes. Should this be an unviable option for your storage circumstances, label rolls and sheets should be stacked evenly on top of one another (horizontally) on a flat surface. Do not store label rolls on their side (vertically) with the labels in contact with any surface. Do not store labels in direct sunlight or where they can be exposed to the elements, heat radiation, chemical contaminants, moisture or oils. 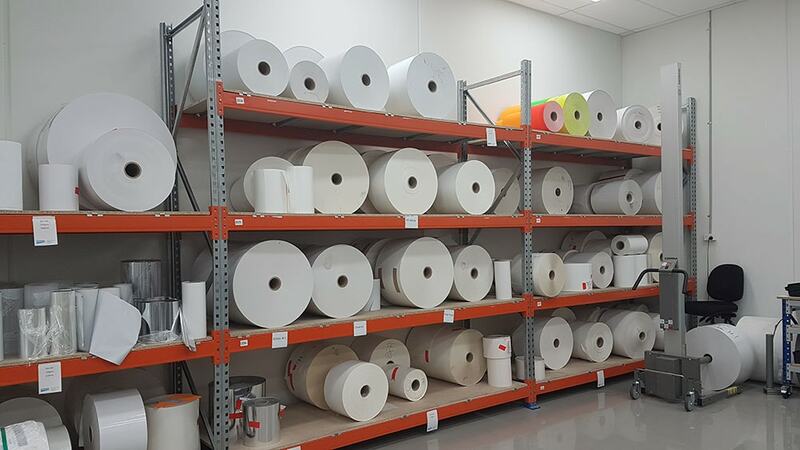 Optimum label storage temperature should be approximately 22℃ +/-2℃ and at a relative humidity of approximately 50% +/-5℃ to avoid adhesive bleed and reduction in performance. Utilise good stock rotation practices to ensure older rolls are used first, preventing stock from becoming old and losing performance. Most Self-Adhesive label materials have a guaranteed shelf-life of up to 24 months from date of delivery, with some exceptions having only a 12-month shelf-life, provided the rolls or sheets are stored in the correct conditions as listed above. When removing label rolls from transport boxes for use, ensure they are lifted out evenly to avoid coning of the material. Ensure the surface you are applying the label to is clean, grease and oil-free to ensure optimal adhesion will occur. When applying, avoid touching the back of the label as this will contaminate the adhesive and may affect performance. Do not loosely apply the label.Some amount of pressure must be applied to the full label area to ensure correct adhesionand to avoid peeling, especially around the edges. Initially, the surface from which you are removing the label can be heated with a heat source such as a hairdryer to soften the adhesive, after which water can be used to assist in peeling the label away. This is more effective on polypropylene or polyethylene labels. Should the above method fail, or if your label is manufactured from a paper material, submerging and soaking in warm or hot water for an extended period will loosen the adhesive and the facestock for easier removal. Alcohol, Acetone and white spirit products can also be used on particularly aggressive adhesives;however they do pose a risk to the original surface as solventscan cause frostingand other damage. Take extreme care when utilising these methods as there is a high risk of damage to skin and clothing. Our dedicated team can provide personalised solutions to suit each unique labelling requirement, ensuring that your packaging perfectly suits your brief in design, material, adhesive and quality. Follow the links to request a request a Sample Pack or quote.